Until recently, professionals tended to use halogen lights for lighting production of spectacular stage shows or buildings; now Osram Zelion H offers a particularly energy-efficient, durable and robust alternative. Compact, available in light colours white, red, blue and green and with two different reflectors (6° and 10°), Osram Zelion H module with its flexible applications impresses with its very high axial luminous intensity, achieved with the aid of four highly efficient light diodes in combination with an optimised reflector design. These LED modules are suitable for a wide range of different applications and are easy to integrate into different luminaires. There is no need for coloured filters required for conventional lamps, as the LEDs used in Zelion H systems emit coloured light. In addition to energy savings, these systems also make another significant contribution toward lower operating costs: considerable savings can be achieved in the maintenance in difficult to reach areas (such as high ceilings), because Zelion H modules can be used continuously for up to three years. 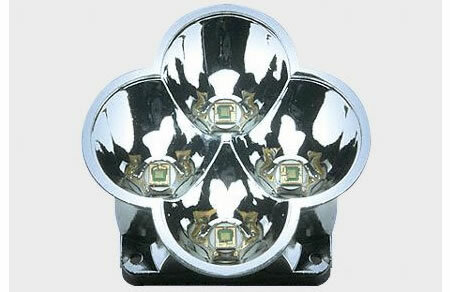 In terms of durability, they are also far superior to other lamps: The service life of a halogen lamp is approx. 3000 hours, that of an LED solution to at least 25,000 hours.